Week IV was very good to yours truly. I went 7-2-1 on the week to bring my overall record to 22-17-1. This week's picks are very MAC-centric (home teams in bold). The last time Boise State lost a regular season game at home (they lost the 2005 MPC Computers Bowl to Boston College 27-21) was 2001, to a Washington State team that finished 10-2. Taking Southern Miss to keep it close on the Smurf Turf may seem a foolhardy endeavor, but this Boise State team is not the mid-major juggernaut they were last season. After rolling up 371 rushing yards (6.75 average per rush) against over-matched Weber State, the Broncos have gained only 224 yards (2.73 average) on the ground against noticeably tougher competition (Washington and Wyoming). The quarterback situation is also a work in progress as Taylor Tharp has yet to show the big play ability Jared Zabransky demonstrated during his time on campus. In addition, Southern Miss is road tested, having already played at Tennessee and won at East Carolina. As long as they don't turn the ball over habitually, the Eagles should keep it close. This line is a little to high thanks to Connecticut's 4-0 start and their 34-14 win over Pitt last week, a game in which the Panthers turned the ball over 6 times. Besides the Panthers, the other three teams the Huskies have beaten are Duke, Maine, and Temple--not exactly the Holy Trinity of collegiate teams. Akron is far from a super power as well, but look for the Zips to give the Huskies all they can handle. Connecticut's win over Pitt will end up being one of the season's biggest flukes once all is said and done. Flashback to last season's game in Happy Valley. One team thoroughly dominated the game--gaining 378 yards while limiting the opposition to 184 yards on their way to a 26-12 wi er loss!? Despite their failings on the scoreboard, Illinois dominated the Nittany Lions last year. The Lions appear to be no better than they were last season (preseason pundits, myself included, put too much stock in their bowl win over Tennessee). Their offense still struggles to score touchdowns against legit teams, negating the stellar play of the defense. The Illini appear to be much improved this season, as their only blemish is a 6 point loss to undefeated Missouri. Lest you think last week's win, and offensive explosion, against Louisville flipped a switch and instituted a football renaissance for the Orange, take a look inside the numbers. 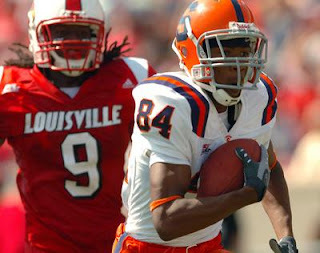 Syracuse was outgained by Louisville by over 160 yards and out-first downed 37-16. In 4 games, Syracuse has an astounding 60 fewer first downs than their opponents (15 per game). Their opponents have gained 927 more yards (231.8 per game), and prior to the last week, their closest margin of defeat was 21 points. To be fair, Miami has struggled in recent weeks (scored only 10 points the past two weeks), but they do have a track record against porous defenses. Against Minnesota (106th nationally in pass efficiency defense), the Redhawks rolled up 418 yards through the air and netted 35 points in an OT loss. Syracuse is 104th in pass efficiency defense. Miami will win a close one and send Syracuse back to the sludge from which they rose last week. The Colorado State Rams are one of (if not the) best 0-3 teams in the country. The Rams have more first downs (60-54), more yards (1186-1121), and a better QB rating (163.48-128.37) than their opponents. The culprit for the Rams' struggles? Punt coverage--the Rams are 105th nationally in punt coverage, allowing 14.7 yards per return and luck--the Rams are 0-2 in close games and have only recovered 4 of 13 fumbles (including just 3 of 10 opponent's fumbles). TCU on the other hand is 2-2, but has been far from the Mountain West dynamo many thought they would be. They have fewer first downs and yardage than their opponents. The Horned Frogs have been winning with defense (14th in pass efficiency defense) and excellent punt returns (20th nationally at 14.8 yards per return). The Horned Frogs are averaging only 19.5 points per game and have scored only 6 offensive touchdowns in 4 games. The Rams may be the best 0-4 team in that country after this game, but they will cover the high number. It's not often a team is a 3 point favorite one week after losing...by 30...to a Division IAA team. Central Michigan got blasted by North Dakota State 44-14 last week. The Chippewas have taken a step back offensively with the departure of head coach Brian Kelly (23.8 points per game down from 29.7 last year), but the more troubling development has been with the defense. The Chippewas are giving up 43 points per game (nearly double the 22.3 they gave up last season). Opponents have completed over 71% of their passes against the Chips alleged secondary, while averaging 8.9 yards per pass, and tossing only 1 interception. Fortunately for them, the Huskies come to Mt. Pleasant with problems of their own. The Huskies are also 1-3 (with a Division IAA loss of their own). Their losses have all been relatively close (largest margin 13 points to Iowa), but the opposition has not been as tough as Central Michigan's. For all the struggles Central has against the pass, Northern Illinois is a team that is not poised to exploit that weakness--only 5 touchdown passes against 8 interceptions on the year. Look for Central Michigan to improve to 2-0 in MAC play with a relatively comfortable margin. The Golden Flashes gave the ball away 4 times in a 27-20 home loss to Akron last week. Kent State outgained the Zips by 130 yards, but were undone by the aforementioned turnovers and two failed 4th down conversions. The Bobcats also fell last week to Wyoming 34-33. In that game, the Bobcats used a 94 yard kickoff return and a 30 yard pick six (and 6 other Cowboy turnovers) to stay in a game where they were outgained by almost 150 yards and out-first downed by 15. Vegas has this game as a toss-up and that seems about right. Our old friend regression will catch up to the Bobcats who have played above their heads thus far against Division IA teams--they have outscored their opponents on the year despite having 37 fewer first downs. The Oregon Ducks have been an offensive machine thus far, averaging 48.5 points while facing some pretty solid competition. 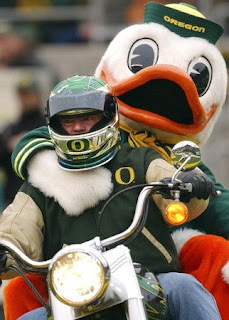 The Ducks have blown teams out in Eugene (Houston and Fresno State) and on the road (Michigan and Stanford). Duck quarterbacks have not thrown an interception all season and the team has a collective 182.11 rating. The rushing attack is averaging over 6 yards per rush. What's not to love? Cal on the other hand has one marquee win to hang their hat on (Tennessee). Unfortunately, the Vols appear to be solid at best and in their only road trip thus far, the Bears were nearly ambushed in Fort Collins by Colorado State. Look for Oregon to roll on their way to a 7-0 start before a huge game in Autzen Stadium on October 27th against Southern Cal. The real question here, is what will the Terrapins psyche be after their meltdown at Wake Forest. With 17 minutes to go, the players and coaches had to think they had that game in their back pocket. Yet here they are, 2-2 and 0-1 in conference play. The Terps did not do a good job of shutting down another Big East rushing attack two weeks ago, allowing 353 yards (7.35 per rush) against West Virginia. They will have to do much better if they hope to stay in the game against Rutgers. On offense, the Terps have not been extremely effective either, averaging only 3.51 yards per rush. The quarterback play has consisted of mostly safe, short passes (68.7% completion rate, but only 9.4 yards per completion). Terp quarterbacks have also thrown 6 interceptions and just 1 touchdown. Rutgers as crushed the cupcakes they have faced thus far and in the process, quarterback Mike Teel may have morphed from liability to legitimate BCS quarterback (236.66 QB rating). I'll reserve final judgement until the Knights play Cincinnati next week. This has all the makings of a blowout. Both these teams have been hammered by their BCS opponents. Western Michigan lost to West Virginia, Indiana, and Missouri by an average score of 25-50.3. Toledo lost to Purdue and Kansas by an average score of 18.5-48.5. They did upset Iowa State 36-35 last week, but look inside the numbers. Toledo had 100 fewer yards and 8 fewer first downs. The Rockets scored their final two touchdowns (after trailing 35-24) on a kickoff return and a fumble recovery in the end zone on a botched punt. The Rockets are vastly inferior to the Broncos. Toledo's opponents have compiled a QB rating of 151.67 (105th nationally). Every team has bombed them with their passing attack. Even Iowa State, a team that entered with a high-water pass efficiency mark of 117.89, compiled an extreme rating (160.56). Toledo is also due some regression in the fumble luck department as they have recovered 9 of 13 fumbles (7 of 9 opponent fumbles). Barring some extremely fluky plays, Western Michigan should roll over the Rockets. This is quite an intriguing game. After falling to UTEP 10-6, in a game they dominated statistically, the Lobos have won 3 in a row, including a road win over the Pac 10's Arizona. Now they host a team that may be the best in the Mountain West. BYU is only 2-2, but they have not lost a conference game since 2005. Stay far away. As any Clemson fan knows, these are the games Tommy usually manages to choke away. Enjoy this game from afar. Remember what I wrote last week about Utah? It rings even truer this week. The Utes have crushed UCLA and lost a close one to Air Force at home. On the road they have managed only 7 points combined in losses to Oregon State and UNLV. Utah State looks like easy pickings, especially on the road, but the Utes are not to be trusted. This Auburn team is not nearly as good as they have been the past few seasons and the Gators are extremely tough at home. Still, this line seems a little high. If there ever was a game not to bet on, this is it. Both teams need this win bad. Terribly bad. Arizona probably needs it more after their 1-2 start in non-conference action. ...Well, well well. Look who's back. ...Illinois. 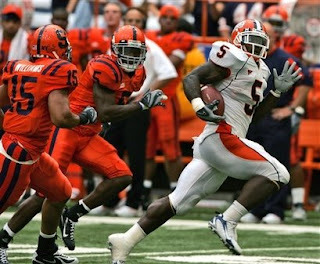 The Illini, led by running back Rashard Mendenhall have nearly as many wins this season (3) as they had in Ron Zook's first two seasons. After rushing for only 33 yards on 11 carries in the opening 6 point loss to Missouri, Mendenhall has surpassed 100 yards every week, and actually crossed the double-century mark against Indiana this past week. He also has 8 touchdowns in only 4 games after scoring 8 in his first two seasons. ...Talk about pulling one out of the fire. Trailing 24-3 last in the third quarter, my Demon Deacons looked all but finished with Maryland inside out 5-yard line. One ill-advised pass later and the score is 24-10 and the stage is set for an improbable comeback. Alphonso Smith deserves a ton of credit for making the play and scoring the momentum-shifting touchdown, but this loss sits squarely on the bell of Ralph Friedgen. Inside the 5, with a 21-point lead, with a first-year starter at quarterback, all it takes is a few runs up the middle and s short field goal (at worst) to put the game away. Instead, one pass play shifts the course of the game and possibly the season for two teams. But before I declare the season saved for Wake, we must get better play from the quarterback position. Last season Riley Skinner was a big reason for the Deacon's success, manage the game (I hate that phrase) and throwing only 5 interceptions in 260 pass attempts. This season Skinner has already thrown 6 interceptions (3 on Saturday) in only 72 pass attempts. ...Did Bobby Petrino take the defense with him to the Atlanta Falcons? After giving up only 16.3 points per game last year, the Cardinals are allowing their opponents to score 32.5 points per game. Against Division IA teams that number is 40 per game. ...Two offensive touchdowns for Notre Dame. ...Yes the scoreboard finally looked good, but Auburn didn't exactly dominate New Mexico State. The Tigers outgained the Aggies by only 43 yards (422-379) and won primarily (here's an old refrain) thanks to their defense. The going gets a lot tougher against Florida this weekend. ...Time to congratulate a couple of teams that I figured would be in for long years. The Connecticut Huskies and Kentucky Wildcats are both 4-0. The Huskies have matched their win total from last season, and while anything less than 3-1 at this point would have to be deemed a failure (Duke, Maine and Temple were the first three teams on the schedule), 4 wins and a good shot at 5 (Akron up next) in September is cause for celebration. Be careful about anointing the Huskies a Big East sleeper though. As mentioned earlier, their schedule has been pretty soft, and in their biggest win thus far, a 34-14 decision over Pitt, the Huskies were outgained, but benefited from 6 Panther turnovers. Kentucky on the other hand, has been a touch more impressive, especially in their last two games against Louisville and Arkansas (although that first win just lost a little luster). After facing Florida Atlantic this weekend, the schedule really heats up with only SEC games left. A bowl game is still no guarantee, even with a 5-0 start, as the Cats must face every team in the SEC East to go along with LSU and Mississippi State. ...In an otherwise uninteresting game between two teams with a combined one win, Northern Ilinois' trip to Idaho did produce some enchanting moments in the Kibbie Dome. Down 35-7 (after 3 defensive touchdowns by Northern Illinois), Shiloh Keo returned a punt 100 yards for a touchdown to get the Vandals within 3 touchdowns at the half. The Vandals nearly came all the way back before falling 42-35. So much for not fielding punts inside your own 10-yard line. 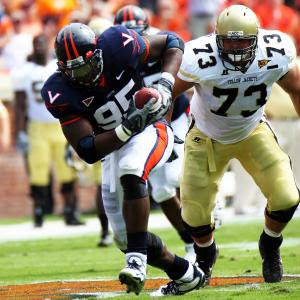 ...Left for dead three weeks ago after a humiliating loss to Wyoming, the Virginia Cavaliers are now 3-0 in the ACC. Two of those wins have been in doubt until the final minutes, the other was against Duke, and Virginia has still been outscored on the season so our old friend regression may yet get the Cavs, but 3-0 is 3-0. The Cavs still have 3 conference games against what looks like the weakest teams in the Atlantic Division (@Maryland, @NC State, and versus Wake Forest). Coupe that with the fact that Miami and Virginia Tech do not appear to be as dominant as they have been in past years, and well why can't the Cavs dream? ...Finally, I'm gonna go out on a limb and do some serious extrapolation, but bear with me. Central Florida whipped what I believed was one of the best teams in Conference USA coming into the season (Memphis) 56-20 on Saturday. The Knights have 9 more games (10 more counting the Conference USA Championship Game), so this is a long way off, but what if...The Knights win out? Their only loss thus far has been by 3 points to Texas. The two non-conference games they have left are against Louisiana-Lafayette and South Florida. The game against the Ragin' Cajuns is not a resume builder, but a win over a South Florida team that finishes with 8 or 9 wins could give them a boost. Winning out would also net the Knights wins over Southern Miss and Tulsa (and possibly Tulsa again or Houston in the Championship Game). The question I'm posing is: Would a one-loss Central Florida team (assuming Texas loses only once or twice) have a better BCS argument than an undefeated Hawaii team and would they get a bid? Week III was a ho hum week as I went just 5-6 with my picks bringing my cumulative record to 15-15 on the season. I continue to struggle picking dogs (5-10 through 3 weeks), but excel at picking favorites (10-5 through 3 weeks). As always, home teams are in bold. Texas Tech is one of those teams that we still don't know too much about. They destroyed SMU 49-9, came back to knock off UTEP 45-31, and defeated an awful Rice team 59-24. Two of those games were on the road (SMU and Rice), but I think it's fair to say Stillwater is a whole different animal. Speaking of the boys from Stillwater, the one thing we know about the Cowboys is that they cannot win on the road. Georgia and Troy both stomped them pretty handily on the road. Still, the Cowboys have too much talent on offense to not give the Red Raiders a game at home. They won't win, but they will put up a good fight at home. Yes Iowa lost last week to what likely is a terrible Iowa State team. However, that was a rivalry game on the road, and Iowa State has actually won 7 of the past 10 meetings. The Hawkeyes are actually 4-2 coming off those 6 previous losses to their in-state rivals. Plus, the team on the other sideline has not exactly been dominating opponents since their opening rout of Washington State. The Badgers squeaked by UNLV and struggled against the Citadel in a 45-31 win. Iowa's offense is still going through some growing pains with Jake Christensen taking over for the departed Drew Tate, but their defense has been superb thus far (allowing no touchdowns on 3 games). Look for this night game to be a defensive struggle that Wisconsin pulls out by a narrow margin. Virginia's win against North Carolina last week was impressive because 1) it came on the road and 2) because they scored more than 20 points against a team that doesn't play their home games in Durham. After a huge struggle-fest in Wyoming in the first game, the Virginia quarterbacks have actually played competently, especially freshman Peter Lalich. Georgia Tech was somewhat exposed as an ACC pretender last week in their 24-10 loss to Boston College that was never in doubt. Thus far, all Georgia Tech has on their resume is a road win against a Notre Dame team with an impotent offense, and a home blowout of Samford. At first glance, this game appears to be a total mismatch. The Gators are flying high, ranked in the top 5 after an impressive home win over Tennessee, while the Rebels have not won since edging Memphis 23-21 three weeks ago. One variable will help the Rebels cover the spread--the venue. In his 2+ seasons in Gainesville, Urban Meyer has coached the Gators in 8 true road games. His team is 4-4 in those games. Only one win has come by double digits--a 49-28 win over Kentucky (3-8) in 2005. After 3 games, Colorado is not noticeably better on offense than they were last season; in fact they may be worse. Through 3 games they are averaging 17 points per game. Last year they averaged 16.3 per game. This year they are averaging a horrendous 1.7 yards per rush. Last year the running game was the one saving grace of the offense as they averaged 4.5 yards per rush. This year Colorado quarterbacks have a cumulative passer rating of 98.67. Last year they had a passer rating of 96.60. This year, the Buffalo's are averaging 3.8 yards per play. Last year they averaged 4.9 yards per play. Colorado will have trouble getting to 20 points barring a ton of mistakes by Miami. Miami has been less than impressive in their first three games, beating a pair of winless teams (Marshall and Florida International) in underwhelming fashion while getting crushed by the Oklahoma juggernaut. However, Texas A&M has not exactly looked like a top 10 team either. The Aggies have crushed two overmatched opponents (Montana State and Louisiana-Monroe), while coming dangerously close to losing at home to a mediocre at best Fresno State team. In their 3 wins, the Aggies have run the ball extremely well (296 yards per game, 6.35 per attempt), but have struggled passing the ball (52.4% completion rate, 5.43 per attempt). The Aggies won't be able run right over a solid Cane defense (2.86 yards allowed per rush), and will be forced to throw to win. Don't be fooled by the Blue Devils upset of Northwestern last week. This team is still very bad. Northwestern had 10 more first downs (25 to 15) and outgained the Blue Devils by almost 200 yards (506 to 309). The Midshipmen will run all over Duke in a blowout win. The last time these teams tangled in Columbus, Northwestern lost 48-7. And that Wildcat team went to a bowl and finished 7-5. This Northwestern team is nowhere near as good, struggling at home to get by a rebuilding Nevada team and losing to lowly Duke. The Wildcats have had no luck stopping the pass, allowing opponents to complete 2/3 of their passes and only grabbing one interception, while facing 3 teams (Northeastern, Nevada, and Duke) that are not likely to be offensive dynamos this season. Ohio State meanwhile has quietly reloaded at the quarterback position as Todd Boeckman has performed admirably for the departed Troy Smith (153.55 quarterback rating). The Rams have had some tough luck thus far in 2007, losing to Colorado 31-28 in overtime and giving Cal all they could handle in a 34-28 loss. Things don't get any easier this week as they face what looks to be one of the top teams in Conference USA. The Cougars have not missed a beat offensively despite the loss of quarterback Kevin Kolb. Freshman Case Keenum and sophomore Blake Joseph have combined for a 131.58 quarterback rating and the offense has averaged 30.5 points through 2 games. The running game has remained stout too, behind converted wide receiver Anthony Aldridge (292 yards at 7.3 yards per attempt). Colorado State is much better than the 4-8 team they were last year, but that won't prevent them from starting the season 0-3. After what seems like eons of being the preseason sleeper pick in the Pac 10, the Sun Devils appear ready to finally realize that potential under head coach Dennis Erickson. The offense has been humming (averaging 37.3 points per game thus far) and the defense has been very stout as well (only 10 points allowed per game). Their fourth straight home game is also the conference opener for both teams. Oregon State has blown out a Utah team missing their starting quarterback and lambasted a Division IAA team (Idaho State). However, in their only road game, they were crushed by Cincinnati 34-3. The Beavers quarterbacks have been pretty bad thus far (just 4 touchdowns and 8 interceptions), and those numbers won't look any better after this game. Last season notwithstanding, my Demon Deacons have struggled with the Terps. They lost 7 straight from 1999 through 2005 and have not beaten the Terps in Winston-Salem since 1997. Both these teams were not nearly as good as their final records (combined 20-7 in 2006) last year, and at least one, if not both teams, will fail to qualify for a bowl game this season. In the off season, no one thought more highly of the Illini. However, laying two and a half points on the road, even against Indiana, is not something I am very confident in. The Illini have won one Big 10 road game since 2003. Coming into this season, I thought Penn State was the best team in the Big 10. They may be the best team, but they have not done a great deal to convince me yet. Blowout wins over Florida International (winless), a horrendous Notre Dame team, and Buffalo (a game in which they allowed 24 points) have not been terribly impressive. Plus, the Nittany Lions have not beaten Michigan since 1996. The Auburn offense, particularly the passing game, has been awful thus far. Auburn quarterbacks have combined to throw just two touchdowns and seven interceptions in 3 games. The running game has not been much better, averaging only 3.42 yards per attempt. The rebuilt offensive line that returned only one starter is the likely culprit for the offenses struggles. Brandon Cox has completed less than half (49.3%) of his passes and if he can't drive the Tigers down the field against the Aggies (allow nearly 370 yards and 27.3 points per game), then it will probably be a long year when SEC play heats up. After their thrashing of UCLA, the Utes are hot sh*t in Vegas. However, the Utes only outgained the Bruins by 13 yards and were the beneficiary of 5 UCLA turnovers. The Utes have yet to win on the road, and who knows what to expect from the Runnin' Rebels after their near miss against Wisconsin and blowout loss to Hawaii. ...Quite a weekend for the Sun Belt. 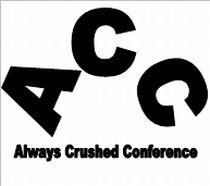 The weakest Division IA football conference pulled some stunners this weekend. Arkansas State showed their impressive showing against Texas may not have been a fluke as they throttled SMU at home 45-28. The Indians rolled up over 500 yards of offense against the Mustangs and jumped on them early (up 21-0 after the first quarter). Meanwhile, Florida Atlantic slipped by Minnesota 42-39. The Owls were aided by 7 Gopher turnovers, but also accumulated 590 yards of total offense. Quarterback Rusty Smith threw for 463 yards and 5 touchdowns, while two players, Cortez Gent and Jason Harmon, had over 100 yards receiving. But the biggest shocker of the weekend had to be the other men of Troy, the Trojans from Alabama, bombing away on the Oklahoma State 41-23. Unlike the last time a Big 12 team bravely strolled into Movie Gallery Veterans Stadium, a 24-14 win over Missouri in 2004, the Trojans did not need trick plays or an offensive linemen picking up a fumble and rumbling for a touchdown to win. They outplayed Oklahoma State from start to finish. The Trojans rolled up over 562 yards on the stunned Cowboys and led by as many as 31 points. What do all three of the games have in common? They were at home (or in the case of Florida Atlantic, in the vicinity of home). So don't expect Nick Saban and Tommy Tuberville to be prompt in returning Larry Blakeney's call requesting a 2 for 1 home and home series with their in-state rival. ...The college instant replay system is terrible. The officials blew yet another call this weekend despite having instant replay available to correct their mistake. Near the end of the Purdue/Central Michigan game, ESPN switched to bonus coverage of Temple/Connecticut. Normally, I would immediately change the channel to a more interesting game, but Temple had a third and goal with under a minute to play trailing 22-17 so I stuck around. On 4th down, this is what happened. That sure looks like a touchdown to me. This is not the first time the officials have confirmed a questionable at best call despite taking another look. 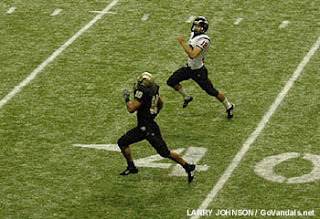 Just from games I've watched there was the endzone interception in the Wake/Boston College game, the missed fumble in the Tennessee/Cal game (my dad a college football official even got his rule book out to show me if the arm is going forward, it does not matter where the ball ends up), and the Fresno State/Texas A&M fumble (the call was correct, but the rules were circumvented to get to it--once the runner is ruled down or out of bounds the officials can't go back and rule a fumble). If replay is going to cost so much money and waste so much time, at least get the damn call right. Don't be afraid to hurt an official's feelings by overturning the call if he blew it. ...Is this the year Southern Cal's strangle hold on the Pac 10 ends? Oregon sure looks like a viable candidate to knock off the Trojans. One week after embarrassing Michigan in the Big House, the Ducks returned home and dropped 52 a Fresno State team that took Texas A&M to the wire one week before. ...Still no offensive touchdowns for Notre Dame. 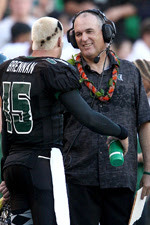 ...Colt Brennan rushed for more touchdowns (3) than he threw for (2) against UNLV. Week II was much kinder to yours truly. I went 6-3 over all (still a little disappointed in only picking two dogs correct out of five), and am a solid 10-9 overall. One of the games I picked (Memphis @ Arkansas State) was postponed, so I'll be picking 6 favorites to make up for it. Rejoice (home teams in bold). Yes the Wildcats laid the lumber to Northern Arizona to the tune of 45 points and 490 yards, but lost amidst the scoring is the fact that Willie Tuitama completed just slightly better than 50% of his passes (23 of 44). He did throw for 5 touchdowns, but he also averaged less than 6.4 yards per pass. The New Mexico Lobos have a solid pass defense. In their first game, they held UTEP to 81 yards through the air (on 25 attempts) in a close loss. In their second game, they held a very good quarterback (Chase Holbrook of New Mexico State) somewhat in check (intercepting him twice) and defeated an improving Aggies teams. The Lobos should be 2-0 (they nearly doubled up UTEP in yards, plays, and time of possession), but thanks to red zone failures are only 1-1. They may not knock off Arizona in Tucson, but asking Arizona to cover a double digit spread is too much. After two games, the Florida bandwagon is filling up while the Tennessee bandwagon is running on a spare after blowing a tire in Berkeley and actually just pulled over after narrowly avoiding a head-on collision against Southern Miss. Tennessee's defense has been less than stellar, giving up 32 points per game (to be fair, 14 of Cal's points came off two returns) and an ugly 6 yards per play. However, the offense has been surprisingly ultra-efficient despite losing their top 3 receivers from last season. Florida on the other hand has waltzed over two lesser opponents, but Urban Meyer has to be concerned with the fact that Troy did score 31 points on his young defense. 24 were scored in the second half, presumably in garbage time, but remember, the Gators never allowed more than 28 points in any game last season. The country knows Tennessee is not a national title contender. After Saturday, they will know the same about the Gators. Don't get me wrong, I think Paul Johnson is one of the best coaches in college football. However, Navy's track record against good to decent teams is questionable at best. In his five plus seasons, the Midshipmen have played 18 games against teams that finished with winning records (this is assuming Rutgers finishes this year with a winning record). His teams are 3-15 in such games. The wins have come against Air Force (7-5 in 2003), New Mexico (7-5 in 2004), and East Carolina (7-6 in 2006). Those wins came by 3, 15, and 5 points respectively. Maybe you are of the opinion that Ball State finishes with a losing record. I am not. Hence take the Cardinals. One week after allowing over 600 yards passing and 31 points to North Texas, the Mustangs face-off against another Sun Belt team, this time on the road. SMU's pass defense is to be blunt, not too good. However, the two teams they have faced thus far are about as pass-wacky as they come (Texas Tech under coach Mike Leach and North Texas under first year head coach and high school coaching legend Todd Dodge). Arkansas State's claim to fame is an 8-point loss to a disinterested Texas team on Labor Day Saturday. The last time Arkansas State was favored over a non-Sun Belt team was 2003. There's a reason for that. Oh and Arkansas State lost that game 54-7 (to Tulsa). Some things in life you can just count on. Like Hawaii struggling on the road. The Warriors somehow gave up 44 points (38 in regulation) to a Louisiana Tech team that was allergic to the endzone last season (18.6 points per game). The Rebels on the other hand, led Wisconsin mid-way through the fourth quarter before falling 20-13. The game against the Badgers wasn't a fluke in the sense that Wisconsin did not cough the ball up 6 times and UNLV did not have three returns for touchdowns. The Rebels just played solid football. They were outgained by only 42 yards and actually had the game's only turnover. The Rebels held the Badgers to only 138 yards passing on 26 attempts. They did get ground up in the running game (210 yards and 5.1 yards per carry), but their opponent this week is not exactly keen on running the ball. The Warriors have just 30 attempts in two games. The Rebels won't end Hawaii's BCS dreams, but they'll do enough to tarnish Hawaii's rep as a top-25 team. In their first two games under first year head coach Butch Jones, the Chippewas have not exactly been into defense. They have 'held' opponents (Kansas and Toledo) to 83 points, 1020 yards, and an astounding 176.98 quarterback rating. Chippewa opponents have completed over 67% of their passes while throwing 8 touchdowns and zero interceptions. That's not a good recipe to take on the road against a Purdue team that has scored 52 points in both it's games. This line is probably a bit of an overreaction to Minnesota's first two games: two home OT affairs against solid MAC schools (Bowling Green and Miami). The first was an excruciating loss, while the last was a thrilling win. The Sun Belt is a step-down from the MAC and the Gophers, with their superior size will run over the Owls. This game has all the makings of a sucker's bet. Conventional wisdom says take the Huskies. They are 2-0, fresh off a program-building upset of the nation's small-time darling, and playing at home against a team that struggled to put away Akron. Lost in that equation is the fact that Washington has built it's early season rep on wins over perhaps the worst BCS conference team (Syracuse) and a home win over a team that is notoriously mortal on the road (not so much in record, but certainly in winning margin). Ohio State will be making plans for their Big 10 opener late in the 3rd quarter. The Jayhawks have been bombing on under-manned teams in the early going in 2007. They are averaging 57 points per game, have accumulated over 1000 yards while averaging 7.4 per play, and have an ungodly 196.25 quarterback rating. They face a Toledo team that has given up 52 points in both of it's games while allowing 6.8 yards per play. Ye gods. At the very least this game should be quite entertaining. I don't care how many points Kentucky scores against Louisville's suddenly porous defense (gave up only 16.3 points per game in 2006), Louisville will score at least 8 more. In one of the most misleading final scores of the past weekend, BYU outgained UCLA by almost 200 yards (199), yet lost by 10 thanks to 3 lost fumbles and an interception return for a touchdown. Tulsa's only game thus far was an underwhelming road win against Louisiana-Monroe. What do we know about either of these teams? We know BC can beat two average to bad ACC team's at home, especially when one turns the ball over 7 times and the other loses their starting quarterback. We know Georgia Tech can hold Notre Dame without an offensive touchdown and can beat Samford. The answer: We know nothing. How good is Air Force? They are 2-0, but their wins are over a non-Division IA team and a Utah team missing it's starting quarterback. Plus, do they still run that option or is it being phased out. Only time will tell. Fresh off a 34-3 spanking of Oregon State, this looks to be easy money. Not so fast. Cincinnati's win on Thursday was the least impressive 31 point win I have ever seen. They gained only 229 yards of offense and benefited from 7 Oregon State turnovers. I still think Cincinnati is one of this season's biggest surprise teams, but Miami has actually won 4 of the last 6. In case you missed it earlier, UCLA knocked off BYU last week 27-17 despite being outgained by almost 200 yards. However, the Utes are still missing their starting quarterback and are a shell of their former selves without him. After last week's impressive performance by Louisiana Tech against Hawaii and sloppy performance by Cal against Colorado State, this line looks ripe for the picking. However, Cal is a different beast at home, and we don't yet know what the Bulldogs are like on the road. ...For a few schools with designs on special seasons, defense was optional. 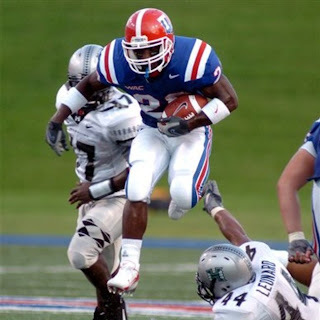 First, in Ruston, Louisiana, the Hawaii Warriors gave up 410 yards and 44 points (38 in regulation) in their 45-44 win over Louisiana Tech. The Warriors have the schedule and the offense to compete for a BCS bid this season, but if this game is any indication, their defense has a long way to go. The Bulldogs averaged only 18.6 points per game last season and scored more than 30 points just three times (Nicholls State, Utah State, and North Texas). Kudos to first-year coach Derek Dooley (Vince's son) for going for the win in the first OT by attempting a two-point conversion. Next in Dallas, the SMU Mustangs, a team seeking its first bowl appearance since 1984, allowed 31 points and over 600 yards passing in their 45-31 win over North Texas. The Mean Green averaged only 12.8 points per game in 2006 and broke the 30-point barrier only once (Louisiana Tech). In fact, their ironically named quarterback, Daniel Meager, threw for only 517 yards last year. This performance also comes just one week after the Mustang defense allowed over 450 passing yards and 49 points to Texas Tech. Then, in Oxford, the Missouri Tigers, a team with a realistic shot at nabbing the Big 12 North, allowed 534 total yards and 25 points to Ole Miss in their 38-25 win. The Rebels averaged only 15.7 points per game last season and scored more than 25 points twice (Memphis and Northwestern State). Last week the Rebels managed only 1 offensive touchdown and 275 total yards against Memphis. The Tigers also gave up 34 points and 435 yards to Illinois. Finally, on Thursday night, at home no less, Louisville surrendered 42 points, 555 yards, and plenty of big plays to Middle Tennessee State. Those same Blue Raiders were held to 14 points and 217 yards last weekend to Florida. Florida Atlantic. Each of these teams must improve substantially if they fancy meeting their preseason expectations. ...What a bad weekend for the ACC. Two of the three marquee programs took it on the chin big time in road showdowns. Virginia Tech got blasted by LSU 48-7 and Miami was trounced by Oklahoma 51-13. While both those games were on the road, it would have been nice for the Hokies and Canes to at least have been competitive. Elsewhere, the league's third marquee program fell behind early to UAB and struggled to beat the Blazers 34-24 at home. Just as a point of reference, those same Blazers lost to Michigan State 55-18 one week ago. Further down the conference ladder, North Carolina fell to East Carolina, and the league's defending champ (Wake Forest) fell at home to Nebraska, despite playing well. More beating could be in store as well this weekend, as the Terps from Maryland host West Virginia on Thursday. The league's best chance for a marquee non-conference win will probably come Thanksgiving Weekend when Georgia Tech hosts Georgia and Florida State and Clemson travel to Florida and South Carolina respectively. It's likely all three teams will be underdogs on that weekend. ...As for what I said about Michigan last week, well here's an official retraction. Michigan is nowhere near one of the top 25 teams in the nation. 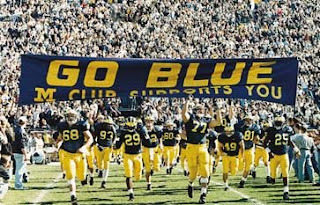 Despite their 0-2 start, the Wolverines still have 6 home games left and will probably avoid the stigma of a losing season. ...Michigan's opponent this weekend happens to be Notre Dame. 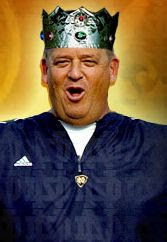 Charlie Weis doesn't look like such a genius without Brady Quinn does he? While Notre Dame will likely improve substantially over the course of the season, right now their offense is atrocious. They have scored 0 offensive touchdowns while allowing over 30 points to both Georgia Tech and Penn State. 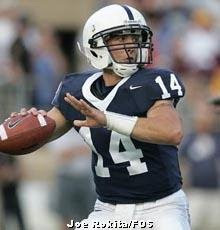 ...Speaking of Penn State, their quarterback, Anthony Morelli, must improve if Penn State is to become an elite team. Morelli completed 12 of 22 for 131 yards with 1 touchdown and 1 interception against a Notre Dame defense not known for shutting teams down. Any guy can win 8 games under center with that defense, but Penn State should have their goals set much higher this season. With their biggest road test (Michigan) suddenly looking not all that tough, the Nittany Lions have the schedule to get Joe Pa to New Orleans and the BCS Championship Game. After playing Buffalo this weekend, Big 10 play begins and the quarterback play must improve. Well, Week I wasn't very kind to my picks (4-6 including a horrible 1-4 on dog picks). But there's always next week (home teams in Bold). I got burned last week by the Beavers, but that game could have very easily gone the other way. Utah lost their starting quarterback (Brian Johnson) just before halftime with the score even at 7. His replacement completed only 9 of 24 passes for 59 yards and the Utes were held scoreless the rest of the way. This is the Beavers first rod game of the season and it comes against a Cincinnati team that is one of this year's biggest sleepers. The Eagles offense looked nigh-unstoppable last week against Wake Forest, but the Pack should put up a little more resistance. They held Central Florida to only 93 yards passing last week. Of course, they gave up over 200 yards rushing and were down by 22 at one point. Still, BC didn't run the ball effectively last week (only 54 yards on the ground), and 14 points is a lot to lay based on only a one game evaluation. If this spread was between 7-10 I'd say take the Aggies in a heartbeat. But what part of their 38-7 win over Montana State convinces you they can beat the Bulldogs by more than 17? Texas A&M won 3 games by more than 17.5 points last year. Those wins were over The Citadel, Louisiana-Lafayette, and Louisiana Tech. Fresno State is a notch above those schools. Western Michigan was trounced last week 62-24, while Indiana won 55-7. So why are the Hoosiers only a one point favorite? Opponent and venue. Western Michigan played one of the nation's top teams on the road (West Virginia), while Indiana played a IAA school at home (Indiana State). Western Michigan was able to move the ball somewhat effectively against West Virginia (26 of 43 for 245 yards). They won't have any trouble moving the ball against an Indiana defense that has allowed over 30 points per game each of the past 5 seasons. If you love offense, be sure to check this one out. If the Aggies can avoid the crippling mistakes that plagued them in 2005 (-23 in turnover margin), 2006 (-10 in turnover margin), and last week (4 interceptions against Southeastern Louisiana), they could be headed to a bowl for the first time since 1960. The Lobos are coming off a 10-6 loss at UTEP. In that game, the Lobos nearly doubled the Miners output in yards (379-195), plays (90-50), and time of possession (38:23-21:37). The kicking game and their inefficiency in the red zone were their undoing as they missed field goals of 32 and 37 yards and managed only 6 points in 4 red zone trips. Against a team like New Mexico State, the Lobos must make the most of their red zone opportunities. The Rebels won their opener against Memphis for the third time in Ed Orgeron's 3 seasons as coach. They should follow that up with a long losing streak for the third straight season. Missouri's offense is just too prolific for Ole Miss. Two of their three touchdowns against Memphis came via defense (99 yard interception return) and special teams (blocked punt). Both these teams were pounded pretty hard by BCS teams last week (Central Michigan by Kansas and Toledo by Purdue). The Chippewas are playing at home, where they were 4-1 last year, and have the superior quarterback (Dan LeFevour). Conversely, the Rockets are playing on the road, and were only 1-5 away from home last season. The Wildcats put up a good fight at Auburn last week and look to be improved over last year's team, at least defensively. The Spartans were not expected to stroll into Tempe and beat the Sun Devils, but they were expected to compete. They didn't. If a 45-3 game can be worse than the score, this was certainly it. They gained a meager 115 yards against Arizona State, a team not typically renowned for it's defensive prowess. Somehow the Indians came within 8 points of upending Texas last weekend. Ah the vagaries of a one-game sample size. Memphis will get it's first win of the season with relative ease. Ball State had a tough 14-13 loss on Thursday against Miami (Ohio), and now looks to get it's offense back on track against the MAC West's weakest team. After last week's narrow escape against Arkansas State, Vegas is practically begging you to pick the boys in purple to give Texas all they can handle. That game against Arkansas State was a fluke. Texas is not as good as they were circa 2005, but they are plenty tough at home and betting against them would not be prudent. The Ducks are another underdog that Vegas is begging you to pick. If Michigan had rolled against App State, this would be a smart bet. Rest assured though, the Ducks have Michigan's full attention. Yes the Irish looked awful, and yes Penn State looked great, but that was the first game for both teams. And don't forget, Penn State played what may be the worst team in Division IA, Florida International. That number is way too high. Two reasons to stay away from this one. #1: Rest--Clemson has only 4 days off before they strap the pads back on against the Warhawks. #2: Motivation--Clemson just won a conference game, at night, against a team coached by their coaches' father. Really think they will be totally focused? Everything about this game screams that it will be close. The Tide will probably win, but that little half a point has me worried. ...Michigan went from #5 to out of the top 25. 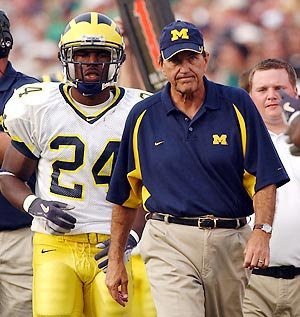 Anyone who thinks Michigan is not one of the 25 best team's in the nation is crazy. ...Thanks to the heroics of Ladarius Webb (pictured), who returned a pick for a touchdown, another IAA team knocked off a IA team on Saturday. Nicholls State upended Rice 16-14, a game which the Owls could ill-afford to lose if they harbored visions of a second consecutive bowl season. The Colonels also held Rice receiver Jarett Dillard to 5 catches for only 41 yards and ended his streak of consecutive games with a touchdown catch at 15. ...A pair of Mountain West teams, Wyoming and BYU, knocked around some of their BCS brethren on Saturday (Virginia and Arizona). The Cowboys held Virginia to 7 yards rushing, 110 total yards, 5 first downs, and only 3 points. Comparatively, Arizona looked like Hawaii against BYU as they gained 32 yards on the ground, 255 total yards, and had 11 first downs. Still, they didn't get on the scoreboard until after more than 59 minutes had elapsed. While it's not as if they stifled offensive dynamos, this has to make fans in Laramie and Provo feel better about their team's chances in the Mountain West, while at the same time making the seat a little warmer for Al Groh and Mike Stoops. 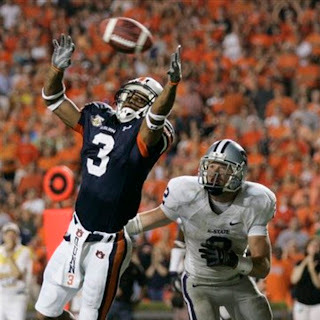 ...If you only glanced at the final score on the bottom of ESPN, you probably thought Auburn was in control for most of their game against Kansas State. If you looked a little closer, or even watched the game, you know Auburn came very close to coming out on the other end. The Tigers defense was stout as usual, holding Kansas State without a touchdown save for one trick play. However, the Auburn offense, behind a senior quarterback no less, gained just 291 yards and scored only one touchdown against a team that gave up 367.5 yards and 29.5 points per game on the road last season. ...Besides Michigan's loss to App State, the biggest surprise among the elite teams may have been the Longhorns 21-13 win over Arkansas State. 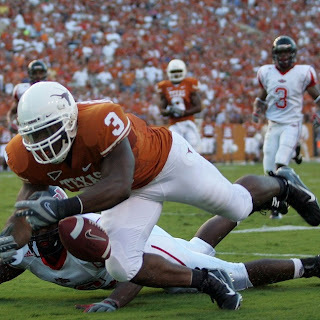 In Mack Brown's tenure, Texas has beaten non-BCS teams at home by an average of 50.3-9.9 (16 games). The only other close game was an 18-13 win over Rice in 1999. Texas was outgained (397-340), out-rushed (125-117), out-passed (272-223), and out-first downed (26-23) by the Indians. 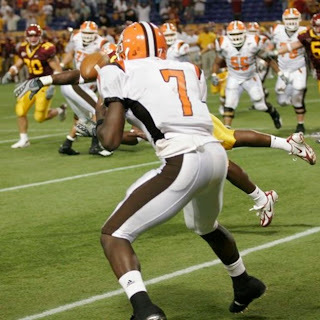 ...The Bowling Green Falcons flew into the Metrodome and left with a win thanks to a successful 2-point conversion (pictured) in the first OT. As should always be the case, decided underdogs should play for the win instead of the tie. ...While Iowa State may be down, a victory for Kent State over a Big 12 team, especially on the road, is cause for celebration. 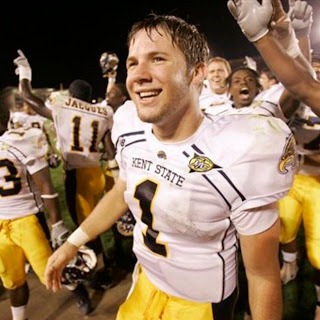 The Golden Flashes were 1-10 in 2005 and now look poised to compete for the MAC Championship and a bowl bid. ...In the first game of the 2007 season, the Colorado Buffaloes passed for more yards (201) than they did in any game in 2006. A big reason for that production is redshirt freshman quarterback Cody Hawkins (pictured).